voice acting Archives - CREATIVOICES PRODUCTIONS I "The Voice of Creativity"
So you’re looking to become a great voice actor and launch your voice over career? Voice acting is an exciting, creative job that is guaranteed to keep you on your toes, challenging more than just your vocal chords. It’s a given that you need to take excellent care of your voice to make it in this business. Without warm-up exercises, daily reading practice, and gentle stretching, your voice won’t be able to keep up with hours in the recording studio. But if you’re really looking to get serious about voice over acting, you need to do more than simply pamper your voice and train your chords. Your voice is not the only part of yourself that will need looking after if you want to become a successful voice over actor. Let’s be honest – being a voice actor is intense, it’s oftentimes stressful, and it can get frustrating at times, especially if you are just starting out and struggling to find work. A dedication and burning passion for your craft are crucial but don’t neglect your body and mind either. Voice over acting requires you to be able to give a lot of yourself at once, and you won’t be able to do your best if you are feeling drained, exhausted, and anxious. No matter how little time you think you have, finding a spare half an hour for a refreshing workout, a relaxing yoga session, or a focused meditation is essential. As an aspiring voice actor, you probably know the feeling that you should be working non-stop if you break into the business. But ask those who have made it in the industry – taking breaks is essential, especially if you are still balancing voice over acting with a daytime job. Working out and stretching both your body and your mind will help you relax. Plus, learning effective breathing techniques will do wonders for your voice over work, too, so get on that yoga mat. Books and online resources are great to learn the tricks of the trade, but nothing is better than real-life training. Depending on where you live, finding voice acting classes might be tricky, but that’s no reason to despair. Simply look for acting classes instead. The skills you will acquire during a good acting class – speaking loudly and clearly, oozing confidence, reading and memorizing lines, and delivering a character like it’s second nature to you – will help you become a better voice actor, too. Plus, while you won’t need your body during voice over acting, it’s a great tool to know how to use to transform yourself and bring a character to life. Stop worrying about your competition. Better even; stop framing fellow voice actors as competition in the first place. Of course, your colleagues and yourself are sharing the desire to land good voice over acting jobs and you might even audition for the same gigs from time to time. But what you share apart from that is much more important – a passion for voice acting and a drive to become bigger and better at your job. Voice over acting is a stressful job, and no one knows better what you’re going through than fellow voice talent. Don’t get intimidated by successful voice actors. Instead, be willing to learn from their experience. Join the community, whether that’s in person or online, lift each other up and exchange ideas, tips, and resources. You will become a better voice actor if you make the effort and get involved – and you will make great friends along the way, too. Voice over acting is great fun, but if you’re serious about this, it needs to be more than just fun. As a freelance voice actor, you are always looking to get hired for the next job. But in order to stop struggling for gigs and establish yourself as a go-to voice, you need to start thinking about your voice as a business. Having an interesting and memorable voice is great, but marketing yourself as a reliable and original voice actor who never fails to deliver is better. Personal branding might be tough, but voice actors can’t neglect its importance. A great way to start is to build a website to promote yourself and your work. If you’re not a coding pro, there are plenty of services out there to help you craft a beautiful page with little tech know-how. Get yourself a domain, pick a theme via WordPress or Squarespace, and get to work. What do you want directors and agents to know? Craft a few paragraphs about yourself and your work, show your voice acting portfolio, include links to your social media presence and your contact details. If you want to take personal branding to the next level, consider starting a blog or using a blogging platform such as Medium to share your expertise and establish yourself as a reliable and experienced voice actor with plenty of advice to give. Loving voice over acting is not enough – to make it in the industry, it’s crucial to learn how to sell yourself. Selling yourself also includes the ability to produce great quality recordings of your voice that will wow agents and directors alike. In an increasingly digitalized market, a professional appearance and a high-quality recording are a must. Your voice reel can’t just be any old phone recording – and no, not even paid for recording apps should make the cut. Invest in a professional studio demo instead. Put together a selection of voice-overs that show how flexible your talent is, ranging from documentary-style recordings to commercials. This reel should really show the entire breadth of your work and convince people of your talent. Yes, it might be costly to go professional for your voice reel – but there’s not doubt that it will pay off in the end. If you want to be a great voice over artist, you need to know that the road to get there is long and winding. But if you start your trek with the right attitude and an open mind, the journey will be much easier. 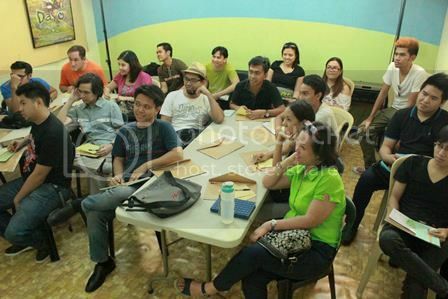 Participants of VoiceWorx 24 learned about character voicing, which is a very essential part of voice acting. 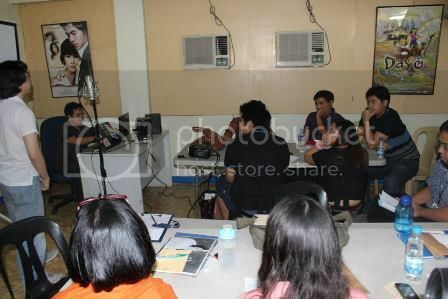 This session was supervised by none other than The VoiceMaster, Pocholo Gonzales. In the course of the session, participants were asked to perform while mimicking voices of different characters. They were also taught about the different techniques on how to come up with various characters through playing with the voice. It’s the 6th of April. For some, it is just another hot Saturday, another summer day of sweat but for some individuals, it is the start of something new and something exciting. It is the beginning of VoiceWorx Batch 24. And so these individuals, who said “yes” in response to the question “Do you want to be a voice artist?”, gather at CreatiVoices Productions Studio in Palanan, Makati City to start the life-changing workshop with a bang. Today, the workshop participants have their orientation. 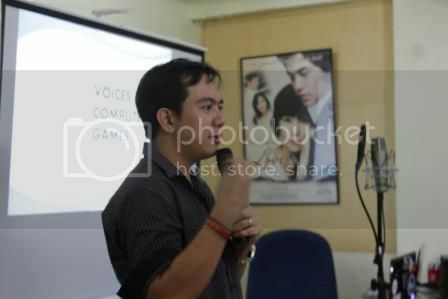 They also learn some basic concepts on voice acting as well under Pocholo “The VoiceMaster” Gonzales and Brian Ligsay. Plus, they have their initial recording through which they will be assessed. At the end of the workshop, they are going to record the same materials again and compare it to these initial recordings. This is just the beginning. Certainly, there are a lot of things to look forward to. Get ready! Voice Acting Campus Tour is here! We told you. It is really epidemic. And now, to keep the virus active and spreading, The Voice Acting Campus Tour is already here. Pocholo “The VoiceMaster” Gonzales together with Brian Ligsay have already begun rocking campuses. Watch out when they are going to visit yours. 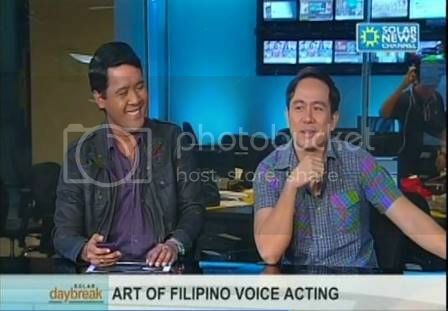 VoiceMaster: The World of Voice Over in the Philippines will never be the same again. PROUDLY PINOY. 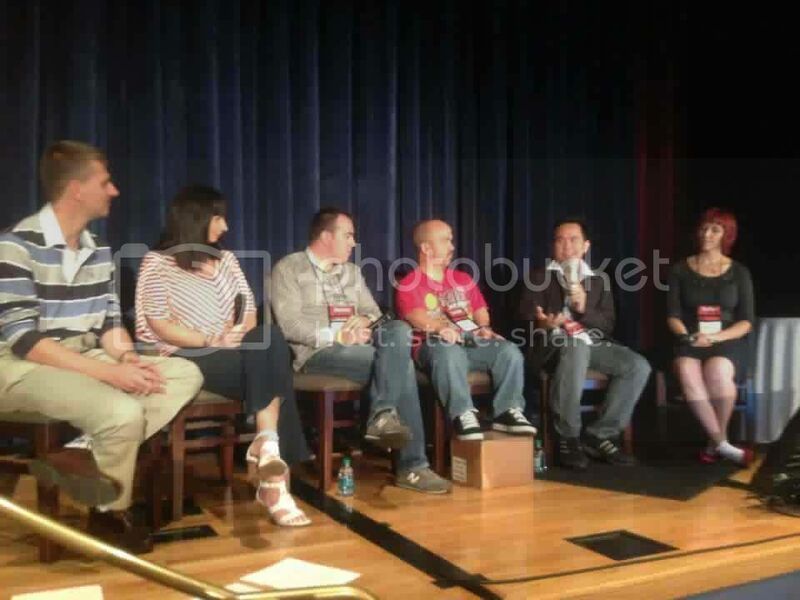 The VoiceMaster shares his ideas with other panelists coming from different parts of the world. He has been doing it in the Philippines. And now, he did it even in the United States. FOR THE PHILIPPINES. 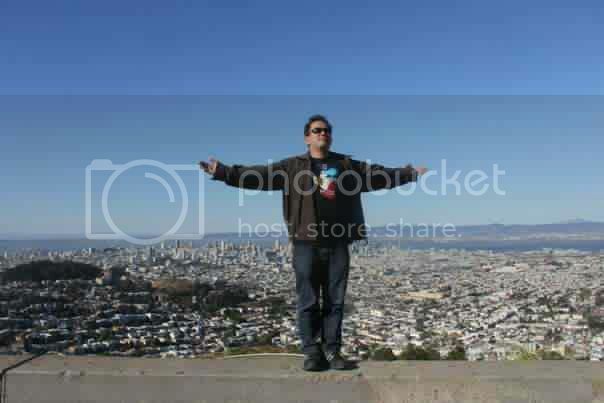 The VoiceMaster “oblates” in California, a sign that he offers this another success to the his own country. 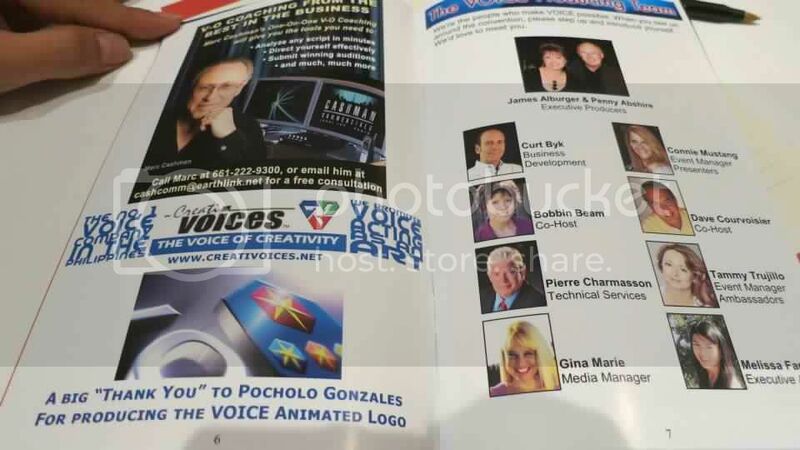 Pocholo “The VoiceMaster” Gonzales, recognized in the international voice acting community, was one of the panelists during the Voice International Creative Experience (VOICE) 2012 held at the Disneyland Hotel and Resort, Anaheim, CA, USA from June 13 to 16, 2012. POCHOLO GONZALES AND CREATIVOICES PRODUCTIONS. Another great experience worth treasuring. Said event was attended by performers, coaches, agents, studio engineers, producers, directors, equipment manufacturers and other vendors who convened to increase awareness, enhance skills and knowledge, share bright ideas, and enrich standards and practices related to voice acting. It was the biggest industry-wide convention that brought these professionals together and be in one in their cause and make a difference. 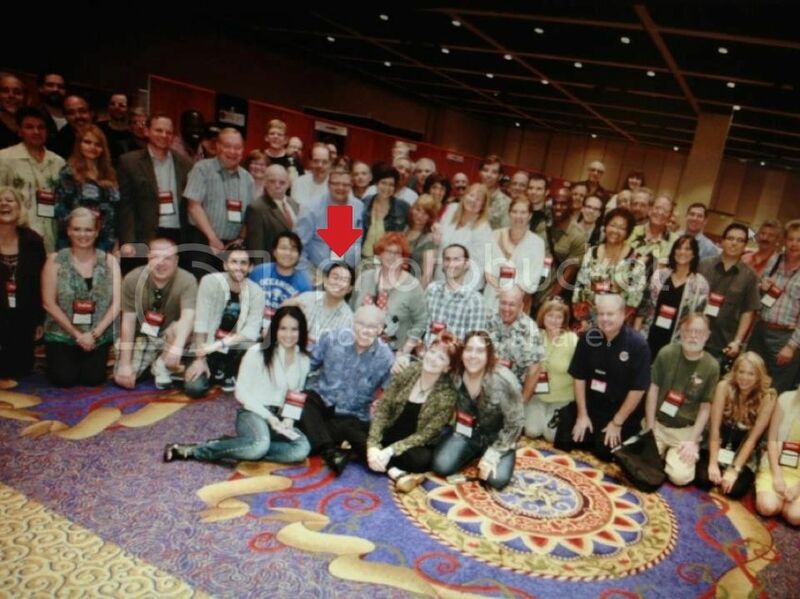 It also made way for everyone to meet and spend time with voice over professionals worldwide. ONE MORE POINT FOR THE PHILIPPINES. Unquestionably, the Voice Acting industry in the Philippines is even getting better through the help of its important personalities like the VoiceMaster in changing and improving its landscape. Being able to join this historical event, the VoiceMaster has taken one more big leap for the voice acting industry in the country. Bringing with him all the things he learned through this magnificent experience, he is now ready to create further changes in the voice acting landscape in the country. THE MASTER WITH THE MASTER’S MASTERS. 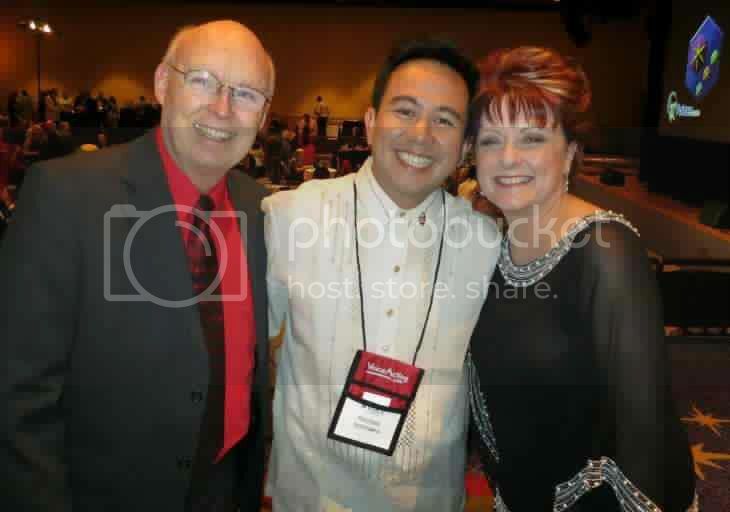 Pocholo “The VoiceMaster” Gonzales with mentors James Alburger and Penny Abshire.